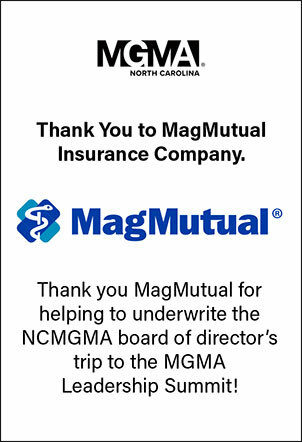 NCMGMA News is an official news resource of the North Carolina Medical Group Management Association (NCMGMA). Articles published in NCMGMA News contains the expressed opinions and experiences of the authors and do not necessarily represent the position of NCMGMA. NCMGMA News may contain links to websites that are created and maintained by other organizations. NCMGMA does not necessarily endorse the views expressed on these websites, nor does it guarantee the accuracy or completeness of any information presented there. Possible “New Year, New You” campaign: January 14-31st, $50 off certification and Fellowship applications. MGMA will be introducing a new volunteer portal; however, they are recruiting for the ACMPE Fellowship Submission Committee, the Examinations Committee, and the Body of Knowledge Standing Committee. Visit the volunteer opportunity web page soon for more details. MGMA has launched the new website and they are working daily to optimize the user experience. The ACMPE claiming of continuing education has been launched under “Manage My Account.” New features will continue to be added including export and transcript details. Be relevant to the Body of Knowledge for Medical Practice Management. Be delivered in a structured learning environment. Have an element of interactivity. Complete and pass both examinations by the Dec. 1-15 exam cycle. Exam results expected late January. Log all 50 hours of continuing education (CE) hours under the current CE requirements, starting 30 days prior to their acceptance date. If your exams are passed, you will receive a 6 months extension to complete your 50 hours by June 31, 2019 under the 2019 continuing education requirements. Earn your CMPE credential within three years. If accepted before Jan. 1, 2019, you will have until Dec. 31, 2021 to complete the program. Log 50 hours of CE credit under the new 2019 CE requirements. Complete Fellowship within two years of your application date. If accepted before Jan. 1, 2019, you will have until Dec. 31, 2020 to complete. If you have a paper outline submitted and accepted prior to Jan. 1, 2019, you may continue working on your paper manuscript up until two years from your outline approval date. Starting in 2019, business plan submissions will be the only acceptable submission if no outline is previously accepted. Log 50 hours of continuing education (CE) every three years following the new 2019 CE requirements. These CE requirements also apply to maintain your current CMPE credential in 2019. Fellowship Preparation Series is available on-demand presented by Lee Ann H. Webster, FACMPE and Nina Chavez, FACMPE. Registration is open for on-demand, For CE credit, you must also register for the post assessments for each session. We are pleased to share with you upcoming enhancements to the ACMPE board certification and Fellowship programs. In our mission to elevate the ACMPE credentials and secure ACMPE designations that continue to demonstrate value in our ever-changing industry, new program enhancements to the ACMPE board certification and Fellowship programs will take effect Jan. 1, 2019. After thorough review of our ACMPE programs with current and future medical practice leaders, these updates were unveiled at the 2017 MGMA Annual Conference. We wanted to remind you of these enhancements by highlighting some of the major changes for each of our programs below. You can also find a full overview of the new qualifications by visiting our 2019 board certification enhancement page or 2019 Fellowship enhancement page. Pathway One: Applicants must have two years of healthcare experience, hold a bachelor’s degree or 120 hours of college credit, be a current MGMA member and pay the application fee. Pathway Two: Applicants must be a current MGMA member and pay an application fee to be eligible to take the multiple-choice exam. Upon passing, applicants become “board eligible” as they work toward earning a bachelor’s degree or 120 hours of college credit, as well as obtaining two years of healthcare experience. Once the 120 college credit hours and two years of experience is obtained, they are then eligible to take the scenario-based exam. The ACMPE board eligible classification allows candidates to enter the board certification program even though they may not yet meet the education or experience requirements. Passing the multiple-choice exam allows candidates to show understanding and knowledge of the principles of medical practice administration. Both pathways require registering for and passing both the multiple choice and the scenario-based exam, as well as earning continuing education credit hours. All applicants after Jan. 1, 2019, will have three years from application date to complete their exams and earn the requisite continuing education hours to become certified. Log all 50 hours of continuing education (CE) hours under the current CE requirements, starting 30 days prior to their acceptance date by June 30, 2019. Education and experience eligibility: To participate in the Fellowship program candidates must either have a Bachelor’s degree AND seven years of healthcare experience, OR a Master’s degree AND five years of healthcare experience. At least two years of this experience must be in a leadership role. Volunteer hours: Fellows will be required to complete six volunteer hours to showcase commitment to our industry. These hours must include at least three hours from healthcare related opportunities and the remaining can be from general community service. Business plans: To ensure Fellows are seen as thought leaders within healthcare organizations, program changes focus on demonstrating the ability to execute on dynamic solutions to business problems. Therefore, the professional paper submission will be phased out and replaced with a submission of an innovative business plan. We believe this move will better support our Fellows to concretely demonstrate practical skills to current and potential employers. Fellowship deadline: Candidates who enter the Fellowship program in 2019 will have two years from their application date to complete their Fellowship requirements. 30 hours must come from MGMA national, state or local offerings (12 from live learning, such as face-to-face events, live webinars or live teleconferences). 20 hours must come from qualified sources or MGMA that pertain to the medical practice management field. To maintain Fellowship, we will require six hours of volunteering every three years as well. The role of certification and Fellowship has always been to distinguish skilled leaders who can solve healthcare’s most pressing business challenges, which is why the Commission firmly believes these new changes will create stronger recognition and demand for our designations in the industry. As we move forward in implementing these changes, we look forward to your support and thank you for continuing to act as advocates for certification and Fellowship. If you have any questions at all, please feel free to contact the MGMA certification staff at acmpe@mgma.com or call the service center at 877-275-6462 ext. 1888. For those of you who tested for board certification in September and will need to retest for one or both parts of the test in December, MGMA has created a special pilot study group session “to ensure we are being transparent of what is on our current exams, and see if laying out the main topics will help the examinee.” This study group session is not yet available on the website. Anyone preparing for December testing is invited to attend.If you’d like to be added to the roster to participate in the pilot study group, please email me at mtorak@gapgi.com and I will forward your information to MGMA. Don’t give up! The ACMPE claiming of continuing education has been launched under “Account Management.” New features will continue to be added including export and transcript details. Complete and pass both examinations by the Dec. 1-15 exam cycle. Registration is open now through 11/6/18! Receive approval on a business plan proposal or paper outline AND submit a final business plan or manuscript by Dec. 31, 2018. Purchase MGMA membership plus the board certification application in one bundle and SAVE $50! As a reminder, program changes to ACMPE Fellowship eligibility will be implemented on Jan. 1, 2019. 20 from qualified resources, providing proof of attendance. If you have any questions about these changes and how they will affect your status, please don’t hesitate to contact the ACMPE board certification team at acmpe@mgma.com. MGMA annually awards grants of $1,000 in support of members pursuing Fellowship through ACMPE. Continuing education through attendance at events sponsored by nationally recognized professional associations or accredited colleges or universities. Attendance to The Annual Conference to join the 2018 Fellows class in recognition of your achievement. Courses of relevant study at an accredited college or university. All individuals seeking Fellowship in ACMPE, currently working in medical practice management and who plan to attend The Annual Conference in Boston held Sept. 30-Oct. 3 are encouraged to apply. The deadline to apply is May 17, 2018. Follow this link to apply now.